Hi, played a couple of turns of a random battle using P&S via the MP server, all fine. Running Windows 10, all other P&S Campaigns and several other games working fine. 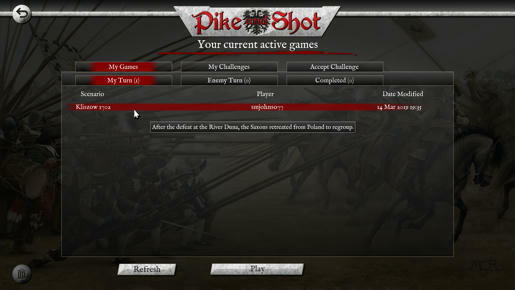 Odenathus wrote: Hi, played a couple of turns of a random battle using P&S via the MP server, all fine. There have been some server upgrades going on, so I think this is likely some fleeting issue related to that. If you try again then hopefully it will work. If not then please contact support@slitherine.co.uk and they can roll back the corrupt turn. Cheers Pip, I'll give those a try. Hello ive got the same problem today not on the Campaign version what should i do? Hope to hear from someone soon thanks. 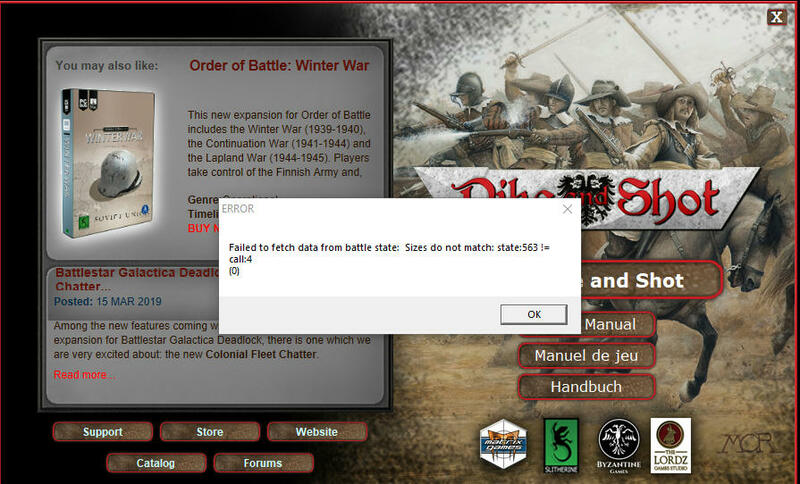 Funnily enough I've just got this new error message when trying to open a P&S (not Campaigns) MP server game. Any thoughts or is it contact Slitherine Support? Guys, can you please send details of the affected games to support, including the turn date and opponent etc. We can then pass these to the server team for further inspection. Support can also arrange to roll back turns to allow the games to continue if the error persists. Hi yes ive got it again on two more games how do you send the details? The other thing it seems to be an on going problem we cant keep getting in touch each turn we have this problem it seems to be a problem with this version of the game not the other one. They should do an over haul of this version see what the problem is. Leonidas048 wrote: The other thing it seems to be an on going problem we cant keep getting in touch each turn we have this problem it seems to be a problem with this version of the game not the other one. They should do an over haul of this version see what the problem is. The PBEM servers have recently been migrated to a new (different) server, and these are probably glitches resulting from this. The PBEM server team are looking into it. Are all the affected games using the original "Pike and Shot" (not campaigns) or is it also occurring with "Pike and Shot Campaigns" MP games? Leonidas048 wrote: Hi yes ive got it again on two more games how do you send the details? If you give them the user names of the two players and the armies involved they should be able to find the individual game instances. Hello thank you for replying so far Slitherine doesnt seem able to resolve the problem. Looks like my two opponents are having the same problems they havent sent their games back to me so i dont know what is happening they have been quite regular. Its only the original game so far not the Campaign version i hope that doesnt become affected otherwise it will put me off buying these games as i prefer the multiplayer side. Hope something can be sorted out. Is this on iPad or PC? I have tried a game on PC without any problems. Have you tried to start up any new games, in case it was a temporary glitch? Hello thanks for replying im afraid ive lost complete contact with my opponents now and they dont seem to be able to pick up the games im putting on the site. One of them ive played for a long time said he used a ipad the other i dont know but hes not playing either so it seems everything has broken down. Ive taken the game off for now and just play the campaign version but my main opponent doesnt have this version i have tried to get him to buy the latest one but some players refuse they are worried if this happens with one version how can they trust the next one im afraid. Hope it can be sorted out thanks. I'm getting a similar although not exactly the same error on trying to load a PBEM++ game. This is with the original (non campaigns) Pike and Shot. Thanks for the report. Has this been happening with other battle instances, or just this one instance? Only this one so far. Going to try to load up with the rolled back turn tomorrow. If that doesn’t work I plan to coordinate with my opponent to start a fresh game. Will update here after seeing how it goes. Roll back of the turn enabled me to load the game successfully...hopefully that sorts it. None of my other ongoing games have had this error so that is good. Also thanks for the prompt and personable support.